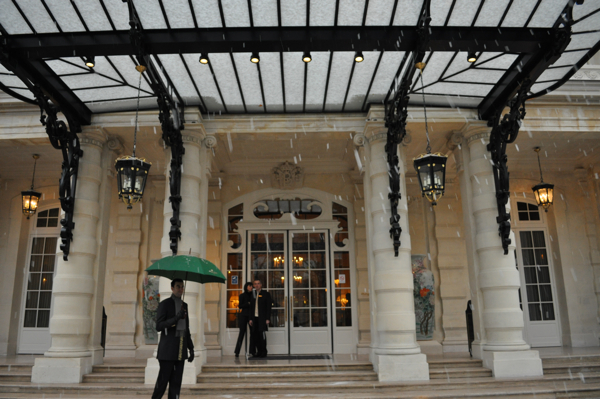 There was a lot of talk, now it's here: the Shangri-La Paris, the first venue of the famous Asian hotel group in Europe,opened on December 17th. 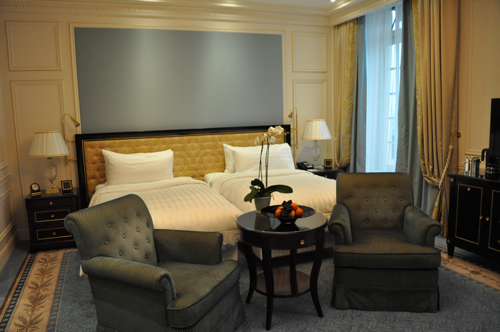 You might think this is just another luxury hotel in Paris. But it’s not. Walk in and you will feel like you’re in a time warp. The meticulously restored Palais Iéna used to be the private residence of Prince Roland Bonaparte – and it still looks that way. Here it’s all about feeling like a prince or a princess yourself: You pass through the original iron gates, discover a lobby with refurbished marbles, an impressive esacalier d’honneur that will probably make you wonder where the young ladies in their satin ball gowns with their delicate smiles are? Everything here looks as if it would be the perfect setting for The Leopard or let’s say the remake of Sissi and you wouldn’t be surprised if Romy Schneider just walked in. This mansion actually dates from 1896, but after decades of serving as an office building, it needed years of intense renovation and a lot of money spending before it regained its historical aura. Not surprisingly, the owner of Shangri-La, the Malaysian Chinese businessman Robert Kuok, gave the whole project a nice Asian twist. In a way the Shangri-La Paris makes you travel through time and continents: here you have the sumptuous French heritage of Empire and Directoire style combined with Asian refinement and elegance. What else could you want? 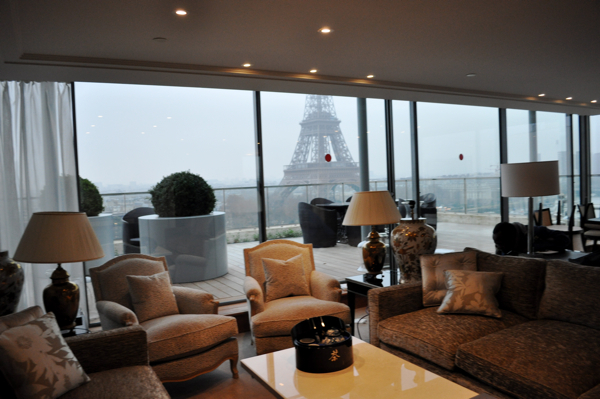 But that’s not all: 40 per cent of the rooms and 60 per cent of the suites have an unobstructed and – let’s face it – breathtaking view of the Eiffel Tower. 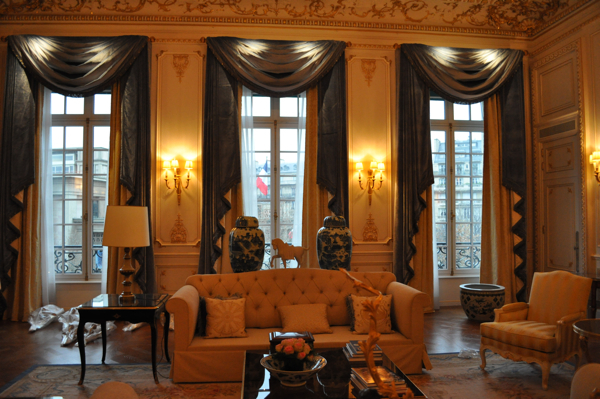 I have to say, the mansion is not situated in the most exciting neighbourhood in Paris. It’s kind of sleepy, but here, on Avenue de Iéna and on top of the Chaillot hill, it is primarily the view, that makes the difference. The most amazing view you’ll have is from the Suite Panoramique. As the name suggests, the 225-suare-metres (2,420 square-feet) suite is perched on the floor of the hotel added in 1966 with floor to ceiling windows and a 100 square-metre terrace. Watching the flickering lights of the Eiffel tower while lying in bed, of course has its price: 16 000 Euros per night, yes, this experience is definitely not for everyone. 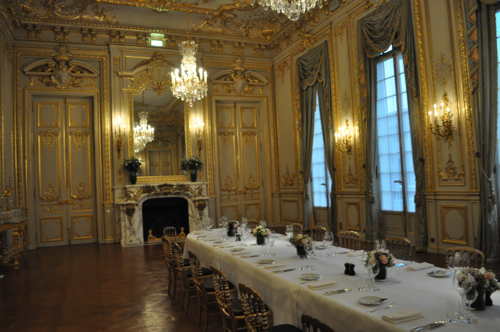 The Suite Impériale doesn’t have quite such an amazing view, but is located in the former private apartments of Prince Roland and is the only one of the rooms or suites listed with Monuments Historique for its beamed ceilings, mouldings, gilt work and decorative carvings. In 275-square-meters you feel like Bonaparte himself. Which one? Emperor or just prince, who cares at this point? So let’s talk about the “simple” rooms: the average rooms measures 47 square metres (506 square feet) and all are designed by the very discreet but notable French decorator Pierre-Yves Rochon and this is not his first hotel (he did the George V and the Ritz in Paris, the Savoy in London), nearly half of them have a private balcony. And with rates starting at 750 Euros (859 Euros with a view of the Eiffel Tower), well, you should expect your marble bathroom with heated floors, separate bathtub and rainfall shower, illumined garment rails in the walk-in wardrobes (I love this) and, last but not least, a flat-screen television integrated into the mirror of the bathroom. Well, when you can afford such prices, I guess, you have to keep an eye on the stock markets even when brushing your teeth. To complete the scenario, the Shangri-La will have three restaurants. The first, La Bauhinia, is already open. A French gourmet restaurant called L’Abeille and a Cantonese gourmet restaurant, Shang Palace, will soon follow. Phillipe Labbé, who until now was chef de cuisine at the two-star Château de la Chèvre d’Or close to Monaco, will supervise all restaurants. Still need convincing? No, just money, right?